As you all know, dating sites cater to different kinds of people. Some dating sites cater to a specific race. One of the niches that are becoming popular is black dating sites. These sites are here to provide to people who are looking for black people that they can date. 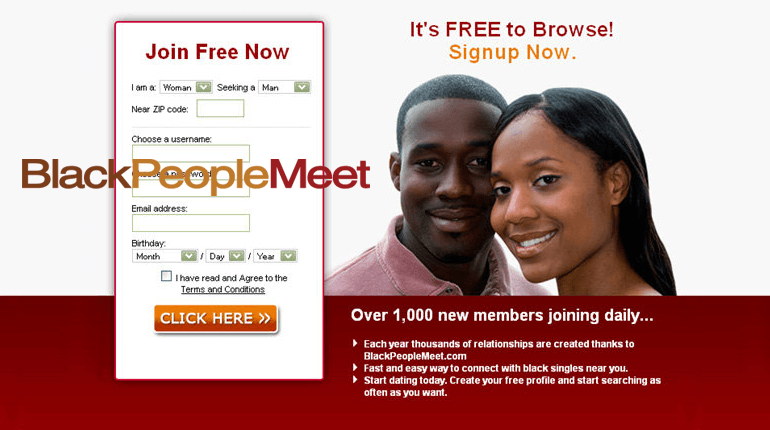 One of the best black dating sites today is Black People Meet. If you haven’t tried this dating site, then the information below will help. Black People Meet is one of the best black dating sites today and is also known as the biggest black dating site. It was established in the year 2002 and is created for single African-American people. The site is here to help people find friendship, dates, relationships, and love. Their primary goal is to ensure that everyone will get to meet and be with each other no matter which part of the world they are. Black People Meet gives a fun, safe, and simple atmosphere, which will make it easier to meet thousands of black singles in your respective areas. Millions have already tried this online dating site, and the site never failed them. One of the reasons why you should choose Black People Meet is it is part of People Media. They are known to provide nothing but the best dating sites on the internet today. If you are looking for long-term relationships or even just casual dates, Black People Meet will surely help you. Another reason why you should choose Black People Meet is that you can find a lot of African-American here. If you are into these people, then you will never run out of someone to chat with. Every week, there are a total of 30,000 active members that are there to chat with you. Majority of its members are from the USA with a total of 900,000 members. Lastly, this site caters to a specific demographic that usually been ignored by many dating sites. Here at Black People Meet, they don’t actually restrict individuals from other races from signing up. For instance, if you’re an Asian or a Caucasian and you love African-American people, then this is the website that’s perfect for you. Signing up is pretty easy, wherein new members are required to provide information, including username, password, birthday, and their zip code. You will also need to describe yourself with no less than 1,250 characters. Signing up will only take you 2 to 3 minutes and five screens. If you are worried about your personal information, the two vital information is your zip code and birthday. But you shouldn’t worry because Black People Meet values their members’ privacy. Once you are done signing up, you can immediately use the website instead of you being stuck on different screens. The entire sign up process will only take you 2 to 3 minutes. You can give virtual gifts to the members that you’ve been chatting so you can get the attention that you need from them. Virtual gifts can be stuff toys, flowers, and even gadgets. Once you have activated the PromoteMe feature, your profile will always be on top of the search results. The MatchMe, on the other hand, will help you to be featured on a daily basis, which is perfect if you want to get more potential matches. This is a great feature because if you are someone who is not sure on what to write on your own profile, you can always hire a professional. At Black People Meet, they have professional writers who help members write their profiles so their profiles will look catchy. The ConnectMe feature will give you a disposal number, which you can then use to contact other members. This is perfect if you are not that confident in using your own personal number. Overall, Black People Meet will give you the perfect match that you want for yourself. With all the features mentioned above, you sure get the match that African-American match that you’ve been dreaming off for a long time already.